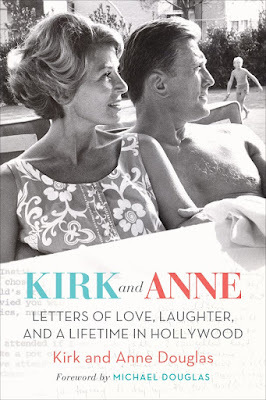 When I received Kirk and Anne: Letters of Love, Laughter and a Lifetime in Hollywood in my media swag bag for TCM Classic Film Festival, I didn't pay the book much mind. I mean that title: it didn't seem like this was going to be the most revealing of books. 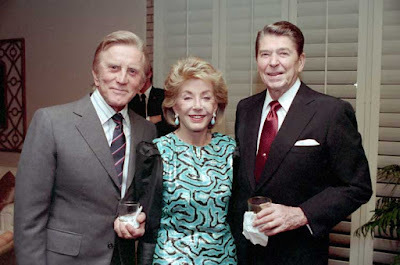 I've also never been a big fan of Kirk Douglas. His accomplishments in the movies and beyond are impressive, but even for an actor his ego is a bit off-putting. Eventually I decided to give it a look though, because these two have seen a lot and I figured they had to have some interesting stories to share about their years in the industry and as a couple of privilege. The book alternates between letters, exchanged by the title couple and with people they have known, and their memories, both about the events they reference and the events leading up to them. There is a lot more biography to this than I expected and it is necessary to put all these communications in perspective. To understand Kirk Douglas movie star and Anne Douglas Hollywood matriarch, you need to see him as a young, impoverished Jew in New York City and her as a privileged, but often neglected boarding school student in Europe. Douglas' massive ego is on full display here, and if you are not a fan, or even if you are, some of his actions will make you want to scream and throw the book across the room. Anne must have been deeply in love, or insane to put up with the insensitive way he treated her in the early years of his courtship. In one passage, Kirk, who has been stringing young Anne along, takes her with him to pick out an engagement ring for his other love, Pier Angeli. Amazingly enough, this was not a deal breaker. After years of uncertainty, the pair marry though, and against all odds, the match endures. While the love letters between them can be syrupy to the point of being vomitous, it is clear that they were deeply devoted to each other. In a time where the husband ruled the roost, Anne always found a way to prevail when she sensed her husband was on the wrong track. While Kirk requires loyalty and submissiveness he can't always return, he also seems to understand that his wife is intelligent, driven and needs power and the ability to pursue her own interests. Because the Douglases have given each other the freedom to live fully, their stories are that much more compelling. Their correspondence and stories are full of interesting tidbits about the movie business, the people who populated it and its social structures and politics. It's encouraging to see how much of their fortune they have donated to causes they hold dear, like the construction of playgrounds for children who would otherwise have unsafe equipment. There were moments here so touching that I was moved to tears. While the Douglases don't hesitate to admit that things haven't always been perfect between them, and that Kirk's infidelities and self-absorption have played a role in their story, you get the feeling there's another, darker story beneath it all. It's in the way they reveal some things, but nothing terribly deep. The way Kirk asks his son in a letter, "Was I a good father?" as if he knows something went awry. You look at his massive charity works and see the good in it all, but is there a search for redemption here? It isn't likely that question will be answered. This is an engrossing, often touching book. It carefully presents exactly what we are meant to see, while hinting at those mysteries throughout. Many thanks to TCM for providing a copy of the book for review.